E de um momento para o outro a moda de Bath Bombs nasceu! Vá sempre soube que existiam sais de banho, com cheiros, etc, mas a criação destas bombas mágicas foi outro nível. Sou a típica pessoa que passa horas no banho, sim até já adormeci no banho! Produtos para banho, para relaxar são sempre bem-vindos cá em casa. 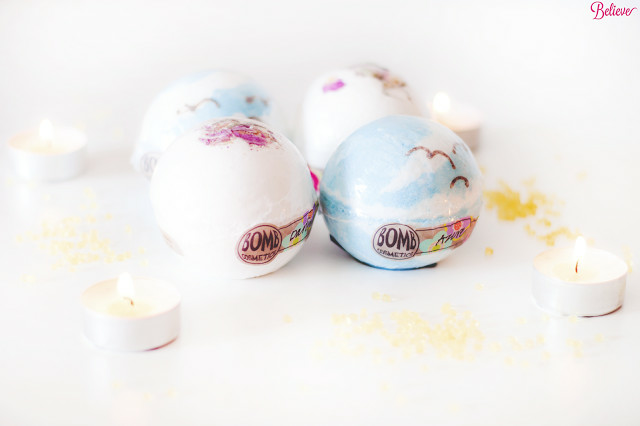 Desde que lançaram as primeiras Bath bombs que andava louca para comprar, mas só o fiz recentemente quando fui aos USA. Optei por comprar os da marca Bomb Cosmetics por serem acessíveis, ter variedade e, claro, porque adorei os cheiros. Para além disso a marca garante que quase todos os produtos são produzidos através de produtos naturais e que não testam em animais. Apesar de ter comprado as Bath bombs nos USA esta marca é do Reino Unido, sendo assim podem fazer encomendas pelo seu website. Comprei quatro Bath bombs, duas Darling Buds e duas Azure Skies. Cada bomba tem cerca de 160g e custa £2.99. Ambos os produtos têm o poder de relaxamento, deixam a água e a pele com um cheiro maravilhoso, e por terem óleos na sua composição deixam a pele muito macia. Se tivesse de escolher apenas uma seria a azul, pois o poder de relaxamento é maior, deixa uma tonalidade de azul lindíssima na agua, o cheiro é mais forte e mais agradável. Em geral fiquei muito satisfeita com a compra e sem duvida que irei voltar a comprar. Alguém já experimentou estas bombas? O que acham? Beijinhos. And from one moment to another the trend of Bath Bombs was born! I always knew the bath salts, but the creation of these magic bombs was another level. I'm the typical person who spends hours in the bath, yes I even fell asleep in the bath! Products for bath, to relax are always welcome at home. Since launching the first Bath bombs I was crazy to buy, but I only did it recently when I went to the USA. I chose to buy the Bomb Cosmetics brand for being affordable, having variety and of course because I loved the smells. In addition, the brand guarantees that almost all products are produced through natural products and do not test on animals. I did bought the Bath bombs in the USA but this brand is from the United Kingdom, so you can order for the website. I bought four Bath bombs, two Darling Buds and two Azure Skies. Each one is about 160g and costs £ 2.99. Both products have the power of relaxation, the water and the skin smell wonderful, and because they have oils in their composition the skin feels very soft. If I had to choose just one, it would be blue, because the relaxation power is greater, it leaves a beautiful blue hue in the water, the smell is stronger and more pleasant. Overall I was very pleased with the purchase and I will definitely buy again. Has anyone tried these bombs? What do you think? Kisses. Nunca usei estas bombas, mas parecem absolutamente fantásticas e relaxantes! Nunca experimentei nenhuma bath bomb, mas fico cada vez mais curiosa! Eu adoro a bomb cosmetics e essas bombas são qualquer coisa!